Set-Theoretic Topology deals with results concerning set theoretic topology and indicates directions for further investigations. Topics covered include normality and conditions in abstract spaces, compactifications, cardinal invariance, mapping theory, product spaces, and metrization. Comprised of 29 chapters, this volume begins with an example concerning the preservation of the Lindelöf property in product spaces, followed by a discussion on closed-completeness in spaces with a quasi-G? diagonal and with weak covering properties. The reader is then introduced to countably compact extensions of normal locally compact M-spaces; continuously semi-metrizable spaces; and closed discrete collections of singular cardinality. 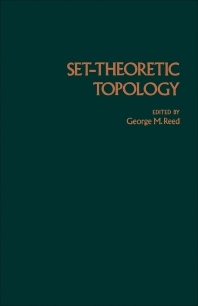 Subsequent chapters focus on open mapping theory; a selection-theoretic approach to certain extension theorems; semicompletable Moore spaces; and non-normal spaces. The book also considers complete mappings in base of countable order theory before concluding with an analysis of locally separable Moore spaces. This monograph should be of value to students, researchers, and specialists in the field of mathematics.